Gertrude T. Maille Peters, age 91, of Harborcreek, passed away peacefully at her home, with her husband at her side, on Thursday, January 31, 2019. 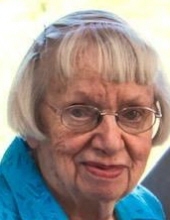 She was born on March 28, 1927, the daughter of the late George and Louise (Kuntz) Maille. Gertrude lived her entire life in Harborcreek and was a 1945 graduate of Harbor Creek High School. She was a wonderful wife, mother, homemaker and the bookkeeper for the family-owned business. Gertrude was preceded in death by a grandson, Sr. Airman Bryan Bell, who was killed by a roadside bomb in Afghanistan; three infant grandsons; two brothers, Joseph and William Maille; one sister, Carol Seifert; two brothers-in-law, Donald Chilcott and Raymond Osiecki and one sister-in-law, Doris Maille. Gertrude is survived by her husband, Ross. They celebrated their 67th wedding anniversary on November 10th. She is also survived by two daughters, Rita Fuhrman (Ted) of Millcreek and Donna Aldrich (Dave) of Harborcreek; five sons: Roy (June) of North East, Gary (Vicky) of Harborcreek, Carl (Mary) of Solon, OH, Mark of Harborcreek and Frank (Karen) of Ankeny, IA. Gertrude is also survived by two sisters, Mary Lou Osiecki of Harborcreek and Helene Chilcott of Erie; one sister-in-law, Beverly Maille of Harborcreek and one brother-in-law, Howard Seifert (Elaine) of Harborcreek. She leaves many grandchildren, step-grandchildren, great-grandchildren, step great-grandchildren, nieces and nephews. Family and friends may call at the Dusckas-Taylor Funeral Home & Cremation Services, Inc., 5151 Buffalo Rd. (at Hannon Rd. in Harborcreek), on Sunday from 2 to 5 and 7 to 9 p.m. A prayer service will be conducted at the funeral home on Sunday at 8:45 p.m. Further visitation will be held on Monday at Our Lady of Mercy Church from 9:30 a.m. until the time of the Funeral Mass to be celebrated there at 10 a.m. by the Rev. Gerald T. Ritchie. Interment will follow at St. Gregory Cemetery. Memorial contributions may be made to Our Lady of Mercy Church, 837 Bartlett Rd., Harborcreek, PA 16421 or to the Community Nursing Services of North East Hospice, 7 Park St., North East, PA 16428. To send flowers or a remembrance gift to the family of Gertrude Maille Peters, please visit our Tribute Store. The Funeral Mass will be celebrated by the Rev. Msgr. Gerald T. Ritchie, Pastor of Our Lady of Mercy Roman Catholic Church. "Email Address" would like to share the life celebration of Gertrude Maille Peters. Click on the "link" to go to share a favorite memory or leave a condolence message for the family.